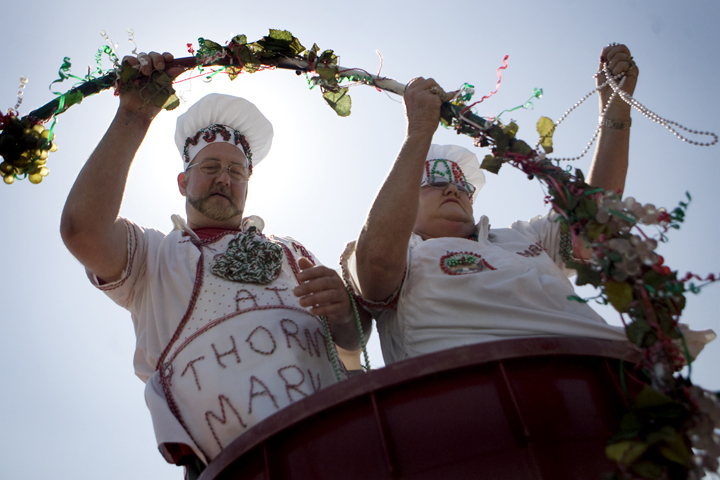 Mark Stremmell and Marty Thornton, both of Herrin, participate in a grape stomping contest at Herrin Fest Saturday. Thornton, owner of Thornton’s Market and Restaurant, and Stremmell, a chef with the restaurant, took third place in the adult category of the competition, stomping 18 cups of juice. The contest is judged on stomping style, costumes, and amount of juice after contestants stomp to music for 90 seconds.